My name is Peter. I am a 47-year-old man. Father of a wonderful 11-year-old daughter and husband to a great wife. I am the middle child of 7, I have 3 brothers and 3 sisters. Both of my parents are alive and healthy. I grew up in Peabody, MA and currently live in North Andover, MA. I have always been an active person with work, sports, hikes, bikes, walks and have even run several marathons. My biggest joy is spending time with family and friends. I am a male breast cancer survivor. 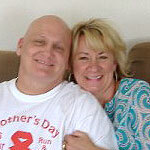 My breast cancer journey started on January 11, 2008 when I woke to find a lump in my chest. After several tests it was determined that I have Invasive Ductal Carcinoma; an aggressive form of breast cancer. Treatment included a radical mastectomy and removal of 22 cancerous lymph nodes. 3 rounds of chemotherapy, 6 weeks of daily radiation, taking part in a clinical trial (including 4 pills every day). I also am on tamoxifen for 5 years. When I heard of Susan’s Retreat from my social worker at Dana Farber I was ecstatic about the possibility. When the representative contacted me and told me we were selected for a weekend away I was overjoyed. My wife and I were given 3 choices; ocean, lake or mountains. We chose the ocean with a seaside view. At that time I was half way through my treatment and unable to work. Having this vacation at such a luxurious hotel at no cost to us was such a benefit to my wife and me. We both loved everything about the hotel, the views, the massage and pool area and the food. Everyone at the hotel and at Susan’s retreat was just fantastic. My wife and I always look back on this trip with such joy; it really helped us out at a time when we needed it. I am so honored and humbled by this whole experience and the kindness and generosity of people. My wife and I look forward to bringing our daughter to this hotel someday to make even more happy memories. Thank you so much for such a wonderful and joyous weekend away.